S. Lucia in Saepta Solis. He repeatedly refused election. Bishops, cardinals, clergy and people represented. S. Gregorio (clandestine nighttime election) uncanonical Schism Anacletus' cardinals joined his Allegiance in 1138. S. Cesareo in Palatino ? Urban IV never visited Rome. Episcopal Palace. One cardinal died. John XXI lived his entire reign in Viterbo. never visited Rome; spent most of his reign in Orvieto or Perugia. Six cardinals died during the Sede Vacante. Four cardinals who had been present left because of illness. Conclave began at Carpentras in 1314; broke; reassembled at Lyon in 1316. Antipopes shown in blue. 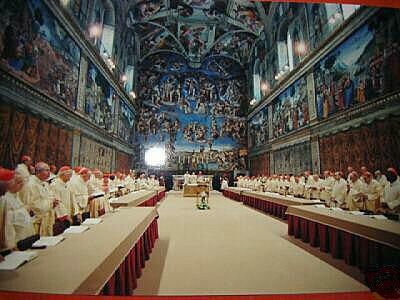 The Participants are those who voted in the final successful scrutiny that elected the pope. The Total Qualified number represents those cardinals who were alive at the time of the canonical election; it does not include those who died during the Sede Vacante. *There were an additional fifteen cardinals living, who were above the age of eighty, and were therefore ineligible to vote at the Conclave, according to the rules in the Apostolic Constitution Romano pontifici eligendo (issued by Pope Paul VI on October 1, 1975). **There were an additional sixty-six cardinals living, who were above the age of eighty, and were therefore ineligible to vote at the Conclave, according to the rules in the Apostolic Constitution Universo dominici gregis (issued by Pope John Paul II on February 22, 1996). ***There were an additional ninety cardinals living, who were above the age of eighty, and were therefore ineligible to vote at the Conclave, according to the rules in the Apostolic Constitution Universo dominici gregis (issued by Pope John Paul II on February 22, 1996). Home Papal Portraits Home Medals Bibliography Greek & Roman History Departmental Coin Coll.